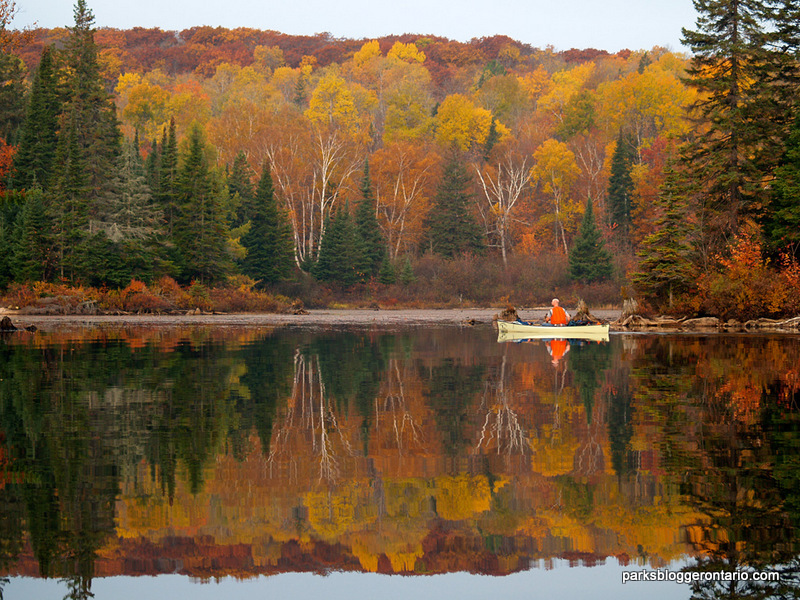 Canoeing Algonquin Park in Autumn is pure heaven! I love this time of year, it is my favourite season and it can be yours too. What’s not to like about autumn? 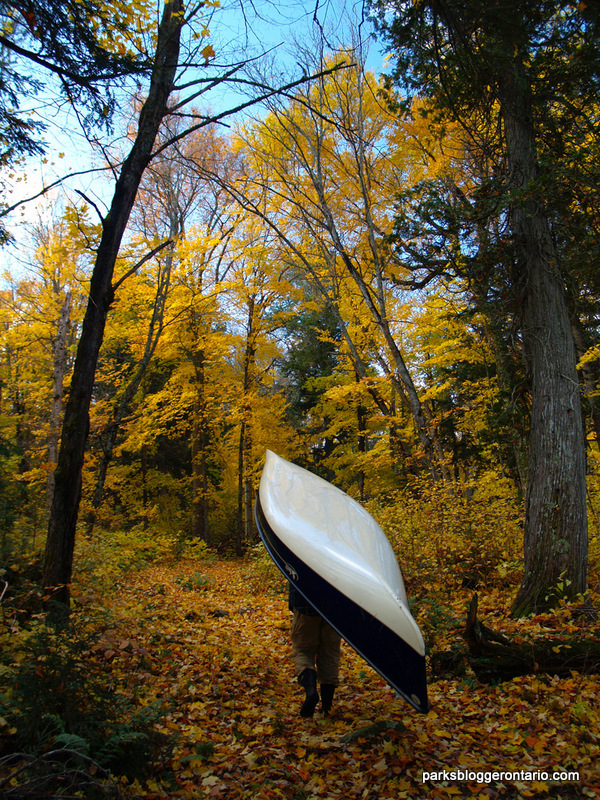 For starters, canoeing in the backcountry becomes a less travelled place in September. With the end of summer, all the kids are back to school and everyone else is back to work. 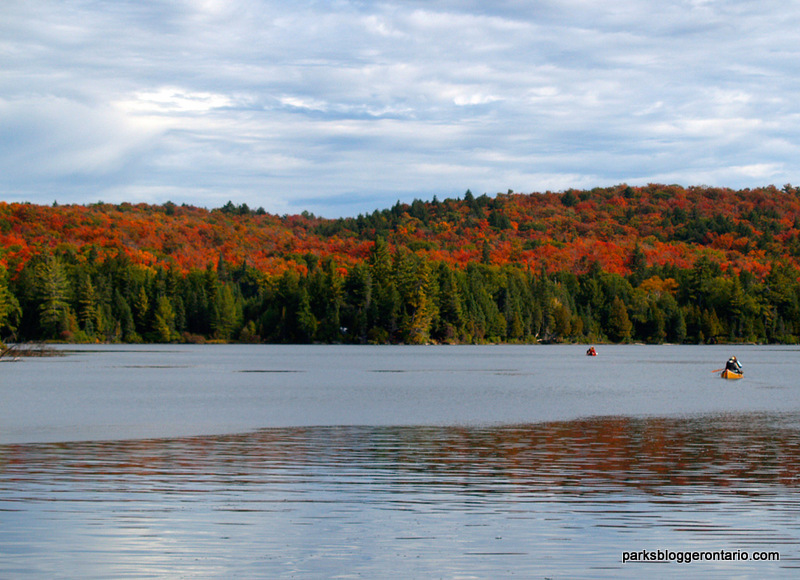 This leaves the interior of Algonquin Park mostly empty for those with more time to explore its quieter side. Those you might encounter in the backcountry at this time of year are usually the more experienced type of paddler – knowledgeable, quiet and respectful of fellow paddlers. Thanksgiving weekend can be the exception though as some see it as the one last big weekend to party before winter sets in. A few extra portages further into the interior will carry you away from such disturbances. There’s also the choice of campsites. 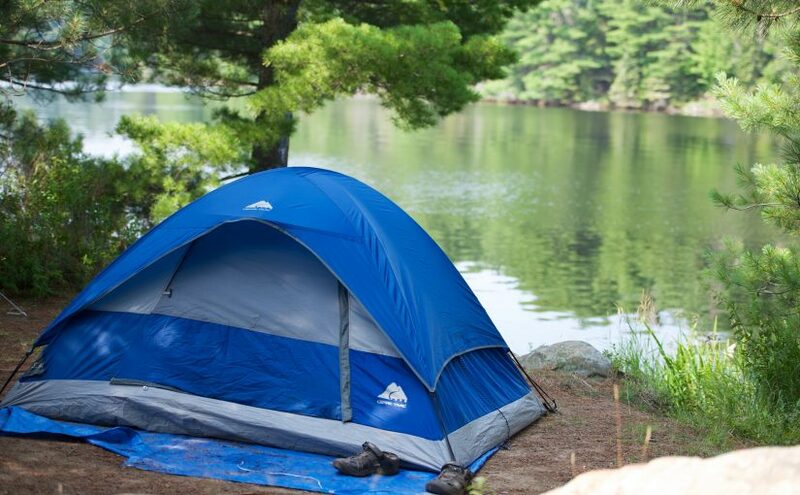 All those amazing campsites that you always wanted to camp on during the summer months but couldn’t, because they were all occupied? Not anymore! Pretty much all of those sites are empty. One must be careful though, some of those ‘summer’ sites are not suitable to camp on in ‘autumn’. One can afford to be picky in the fall though as there is usually many more choices to choose from. There’s several more factors too that make autumn awesome; bugs!! There’s no bugs anymore. At the very least, there is very few of them and the most annoying among them – Mosquitos, deer flies and black flies are but a memory. You’re bound to run into more people then bugs in September and October and even then the number of people drops off significantly after the labour day weekend. Weather is another factor. Typically the weather is stable. This usually means warm sunny days with crisp cool nights. Even if it is cloudy and cool, the benefits to this type of weather are obvious; cool conditions make for portages that are less sweaty, this enables one to travel further on the portage between breaks. The lack of bugs is another added bonus to portaging in the fall months. The cool air also makes for comfortable sleeping conditions. Star gazing in the fall months is great. There’s something about the cool crisp air that makes for excellent sky conditions for celestial observations. Campfires are more enjoyable as the weather isn’t too hot to sit around a fire and at night, the air cool enough to make one huddle comfortably around the fire-pit. The physical activity of collecting and chopping of firewood helps to keep one warm. This is especially true when it gets damp as it often does in the fall months. The weather can take a terrible turn too. It can rain for days on end and when it does, it can be hard to stay warm even if you are dry. Its the damp air that can make things unbearable. Throwing up a tarp high enough above the fire-pit will ensure you can keep a fire going. This is important for without a campfire, there will be no way you can shake-off a chill that you will surely catch if you are damp for too long. Collect lots of fire wood and kindling and stay warm and dry next to your campfire. Paddling some autumn mornings can seem like pure magic; Morning mist that drifts in a haunting manner over the water, cloaking the maples in a heavenly shroud. The ethereal calls of the last few remaining loons of the season carry through the mist, breaking the silence. Eventually, the sun pierces the mist revealing dazzling hues of red, flaming orange and searing golds. The scent of fire smoke drifts into you – inhaling its fragrance, you are reminded its time to finish the paddle and head back to camp for a hot cup of coffee or tea and to enjoy the rising of the warming sun on your bones. One must take extra care when travelling in the backcountry in the fall months. If you are deep in the interior and you’ve injured yourself and are incapable of getting yourself out (especially if you’re solo paddling) it might be days or weeks before another canoeist comes along to be of any assistance. If you’re really late into the season, between late October and into November, then you probably won’t see anyone. You might be the last person through any given area till next May! When the fall colours are past peak and leaf drop has occurred, there are opportunities for exploration. Exploring the forest on foot during this time offers many benefits as opposed to summer travel during full leaf out. With the bare trees, wildlife spotting becomes easier and during the fall months there is more wildlife out and about gathering food for storage for the winter months ahead. Black bears don’t store food though, they fatten up for their winter hibernation. If the weather should turn too windy to paddle safely, the forest again offers the opportunity to keep one occupied. The lack of tree canopy also makes it easier for anyone to find their way back to camp. With the cooler temps down from the summer heat of June, July and August, the food that one brings in with them on interior canoe trips will last longer in the fall months. Foods that can spoil such as cheese, eggs, bread, etc. These staples will last considerably longer with the cool temperatures of autumn. Food choices can be expanded too. Meats for example will stay frozen longer as the ice you pack it in with will melt at a slower rate. The water temperatures are considerably cooler and by the October long weekend are usually too cold to swim in – perfect for chilling wine in a tetra pack. Ever wake up to snow while camping in Autumn? Usually that’s a sign when its time to leave, but that paddle out can be exhilarating. The landscape is transformed and to see it drift by as you paddle unfrozen waters seems almost like you’ve cheated nature. Its like winter camping without the hassle of winter camping. Don’t linger for too long though, autumn snow storms can be brutal in their intensity. 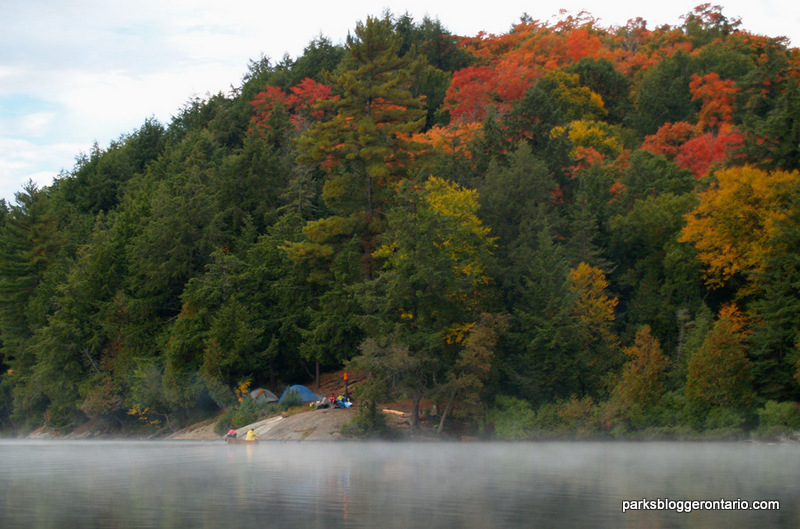 For autumn canoe camping in Algonquin, I have found the north and west areas to be particularly favourable to fall colours. There are in fact more maple trees on the west side of the park. Access#’s 29 and 1 through 4 offer some of the best autumn colour viewing while avoiding the busy highway#60 corridor during the brief rush to see the fall colours. Along highway#60 access points 5 through 12 also offer one the opportunity to launch trips into the interior to look for colours and to experience the extra special solitude and magic that autumn camping offers to the extended season paddler. peak fall colours would be? Thanks, and amazing photos! No mention of hunting season inside the park and the areas most affected. We went west from Brent in October and encountered ATV-transported hunters quite frequently. I understand the south “lobe” of the park is heavily hunted but am unsure of the status in the interior.